It used to be that disparaging things said about people transpired in select places. We have talked about Mrs. Jenkins’s crooked wig in the church parking lot or Sunday’s boring sermon at the dinner table. The most scathing comments made about current events, entertainers, athletes, politicians and other public notables occur in the special venues of the barber/beauty shops and even on the street corner. Usually, debates held in these venues stayed there. That was the rule. Filmmakers have dramatized this culture of talk in films such as Shaft, The Mack, Do the Right Thing, Barber Shop 1&2 and Beauty Shop. The audience is privy to the conversations; yet, it is understood that these acts of talk are exclusive to the community represented within the cinematic frame. Now, the rule has been broken. In the context of our use of privileged spaces, it is quite disturbing to know that the slander directed towards the developing facial features of a 6 month old African American baby named Blue Ivy Carter, the newest addition to the family of Shawn Corey “Jay-Z” Carter and Beyoncé Giselle Knowles, has escaped. The appalling comments center on fear that as she develops, nature will curse Blue Ivy with the full and broad facial features of her own father rather than the European features of her mother. Of course this reaction to Blue Ivy has caused an avalanche of responses from the African American community, with right conclusions that the installed standard of beauty—blond, blue-eyed; thin lips and keen nose—and racial hatred within the community are as robust as ever. I am perplexed, though. Did the issue of nose and lips circulate around Jaden and Willow Smith? Julian Fuego Patton-Thicke? How about Nahla Ariela Aubrey-Berry? Memory fails to bring to bear any calumny towards these babies. Why, then, Blue Ivy? Blue Ivy’s parents have managed themselves well in the world of entertainment. In the intense scrutiny of entertainers, they are the haute-couture of celebrities. There has yet to be a scandal published about them. We have feasted on their talents, and across the board, their performances have been worth the price of the ticket. When Blue Ivy was born, her father blessed her with a song entitled, Glory!, a voiced emotion that church congregants holler when the Holy Spirit has visited them. On February 10, 2012, Beyonce and Jay-Z shared Blue Ivy Carter with us to join them in welcoming her into this/our world. 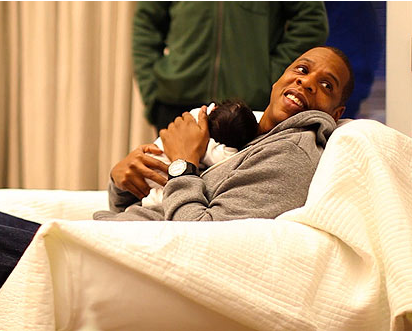 Joy can be seen in Jay-Z’s eyes as laughter spills from his bountiful lips in pictures carrying his daughter. He demonstrates the honor of fatherhood and that of a husband at this point in time of his life. We, in turn, insult them, especially her father. It is safe to hazard that technological advances bear much of the blame. What we spoke in the privacy of the aforementioned venues among each other we somehow knew that we didn’t mean it. It just was the shuck and the jive of the talk. The advent of cyber social spaces such as Twitter, however, has compromised that particular aspect of privacy. A comment removed from the protection of the private space and takes on a life of its own once released. Plus, the post in cyberspace is immediate. This compromise is what R&B singer Gladys Knight meant in her comment on Paris Jackson’s tweets about the family: “[…] people read into whatever they want to read into, that’s how they get the drama.” (http://tinyurl.com/cz55ybt). Now there is a link entitled Twitter Files: The Jackson Family Drama According to Paris that can be accessed and left up to interpretation by anyone. Beyonce and Jay-Z introduced Blue Ivy to a diverse community; some members blessed her while others chose to malign her facial features. Such is the curse of the standard of beauty in this country, “probably the most destructive ideas in the history of human thought” according the narrator in Toni Morrison’s novel, The Bluest Eye. We all must wonder, then, once Blue Ivy comes of age, in her awareness of the world around her, will she look on us and smile? So well said, we are talking about self acceptance of ourselves, or geneology and our race. The standard of beauty should be measured by what’s on the inside and the outside. It is a disservice to one’s ancestors and all that they stood for, to not accept our own hair, skin color, eyes as part of what god gave us and not to be denied because of finding another person’s features beautiful at the same time denying ourselves what god has given us.